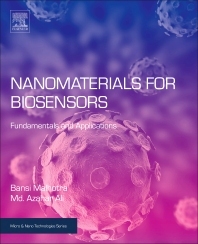 Nanomaterials for Biosensors: Fundamentals and Applications provides a detailed summary of the main nanomaterials used in biosensing and their application. It covers recent developments in nanomaterials for the fabrication of biosensor devices for healthcare diagnostics, food freshness and bioprocessing. The various processes used for synthesis and characterization of nanostructured materials are examined, along with the design and fabrication of bioelectronic devices using nanostructured materials as building blocks. Users will find the fundamentals of the main nanomaterials used in biosensing, helping them visualize a systematic and coherent picture of how nanomaterials are used in biosensors. The book also addresses the role of bio-conjugation of nanomaterials in the construction of nano-biointerfaces for application in biosensors. Such applications, including metal nanoparticles, metal oxide nanoparticles, nanocomposites, carbon nanotubes, conducting polymers and plasmonic nanostructures in biosensing are discussed relative to each nanomaterial concerned. Finally, recent advancements in protein functionalized nanomaterials for cancer diagnostics and bio-imaging are also included. Bansi Malhotra is Professor & Ex-Head, Department of Biotechnoloy, Delhi Technological University, where he has established a nanobioelectronics laboratory. He was formally Visiting Professor at the Centre for Nano-Bioengineering & Spintronics, Chungnam National University, South Korea, between 2009 and 2013, and is former Chief Scientist at CSIR-National Physical Laboratory, India. He currently serves as President of the Biosensors Society of India and sits on the advisory boards of numerous international journals. He has previously published three books, and contributed over 250 articles in peer-reviewed journals.